Alvin (population 316) is located in far eastern Illinois. The town sits just north of Illinois Route 119 about 3 miles west of the Indiana/Illinois state line. 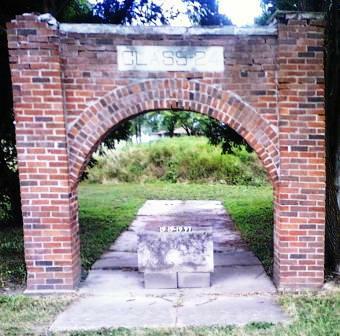 This places Alvin about 10 miles north of Danville in upper-eastern Vermillion County. The Louisville & Nashville Railroad also travels through Alvin. A branch of the North Fork of the Vermillion River flows in and around Alvin as well. "In 1872 the C&EI railroad came down from Chicago passing through the already established village of Rossville. As it went on south it spawned the towns of Gilbert and Bismarck. Gilbert, named after Alvan Gilbert, was about a mile north of Bismarck. In 1876 the Illinois Central established a track east and west interlocking the C&EI about a mile north of Gilbert. The people of Gilbert simply closed their town and moved north to the new interlock renaming the town as ALVAN Thus 1876 is the establishment date of modern day Alvin. By 1900 Alvan had two hotels, two grain elevators, a union train station and numerous businesses. Through an error the name was listed as Alvin by the Post Office. It was not changed by the railroads until the early 1900s. Sources: Alvin Centennial Book "Bits & Pieces of Alvin's Past, 1876-1976" and "Place Names of Vermilion County, Illinois" by the Illiana Genealogical & Historical Society." 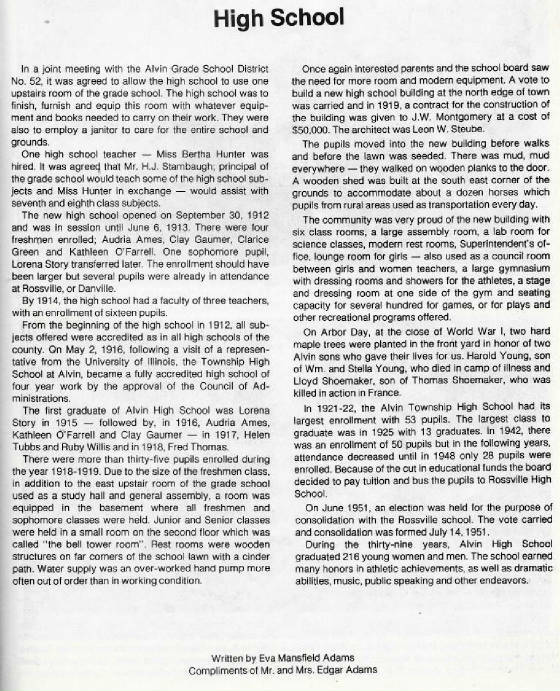 The following history of the Alvin High School district was provided by Don Claypool as found in the Alvin Centennial Book of 1976. As stated in the article, it was in the late 1940s, the townspeople of Alvin and nearby Rossville began consolidation talks. The year was 1948 when a new school district was established between the two towns. The district was appropriately named Rossville-Alvin. The high school for Rossville-Alvin was located in Rossville. 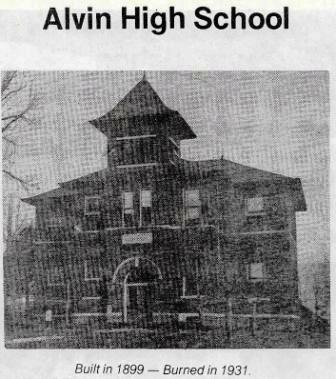 It is not known if possibly the original Alvin High School building was used as part of the Rossville-Alvin School District. 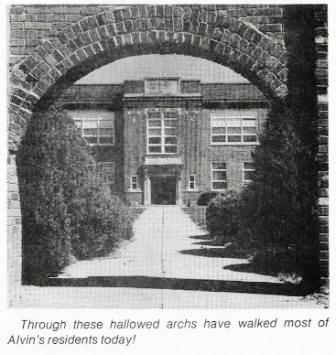 The fate of the original Alvin school building is a familiar but sad one as it has been torn down in 1997. Rossville-Alvin High School District closed in 2005. The Alvin kids now have the option of attending Bismarck-Henning or Hoopeston Area high schools. Alvin High School definately offered boys basketball. The school also produced a STATE CHAMPION in boys track and field! It is probable that baseball was also offered. However there is VERY limited information on the athletic program If you have any information you wish to share please write to us via e-mail. The IHSA website shows Alvin High School winning a District title in boys basketball. Unfortunately the team record and coaches names of this and other successful Alvin High School teams are not available. Scores of games involving Alvin High School in the IHSA State Tournament were located on a website titled "Illinois Postseason Basketball Scores." The scores we found are reprinted below. Beginning of basketball program through 1926-27 Postseason scores, coaches' names, and records needed. 1922-23 through 1926-27 Postseason scores, records, and coaches' names needed. ALVIN (30): Bowman 20, Darr 6, Weyer 2, Hiatt 2. PAXTON (19): Hoffman 10, Turner 8, Mearns 1. STREATOR (25): Dixon 9, Paton 6, Mohler 6, Hart 4. ALVIN (18): Hiatt 8, Bowman 8, Darr 2. 1928-29 through 1931-32 Postseason scores, coaches names, & records needed. 1932-33 Hoopeston District Tournament Coach's name & record needed. 1933-34 Milford District Tournament Coach's name & record needed. 1934-35 Hoopeston District Tournament Coach's name & record needed. 1935-36 Westville District Tournament Coach's name & record needed. 1936-37 through 1939-40 Postseason scores, coaches names, and records needed. 1940-41 Cissna Park District Tournament Coach's name & record needed. 1941-42 through 1943-44 Postseason scores, records, and coaches' names needed. 1944-45 Wellington District Tournament Coach's name & record needed. 1947-48 Potomac District Tournament Coach's name & record needed. **Final boys basketball game for Alvin High School "Pirates". 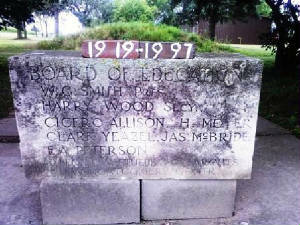 School dissolved and became part of the Rossville-Alvin School District. "A student from Alvin High School, believed to be William E. Bivans, in 1919, placed First in the Mile Run, at the Boys State Track and Field, Class B Championships. On the IHSA Records his name is spelled Bevans, with no first name listed. With the school now closed, and possibility that the student records could be in Hoopeston, or Rossville, or even in Bismark, might turn up verification of enrollment. The 1920 US census, shows a William Bivans living with his parents and brother, in the village of Alvin, in Ross Twp., Vermillian CO. There is no surname of Bevans listed for Vermillian Co., 1920." 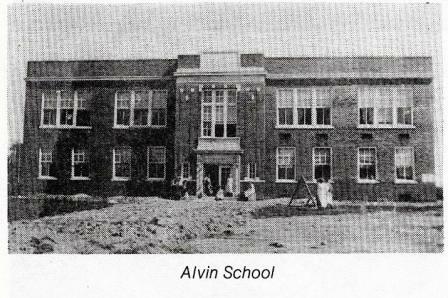 "After Alvin consolidated the building was taken over by the grade school. I went there my 7th and 8th grade graduating in 1950. I had older siblings who attended Alvin High School. My older sister, Thelma Ross, put together the last High School reunion held there. I believe that was about 1970. I knew the Bill Bivans you mentioned. I believe you have that item correct. Bill never married to my knowledge. He use to take vacations out west to add to his large rock collection."